If you have been wondering whether or not you need a new thermostat, chances are that you do. 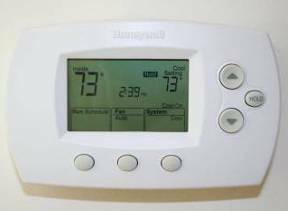 Many Denver homes still use mercury thermostats, which are hazardous to both the environment and your health. There’s no need to worry, however, because Applewood is an expert in the latest and greatest digital, programmable thermostats on the market. In fact, several digital thermostats are now made to imitate the round, vintage design of the mercury-filled thermostats, but without the mercury! As one of the many money-saving, efficient heating services provided by Applewood, digital thermostat installation is a perfect next step toward more efficient home temperature control. They give more precise temperature control. Technology continues to advance, and thermostats are no different. Today’s digital thermostats use electronic controls to achieve precise temperature performance and optimal comfort in your home. We specialize in installing these talking thermostats that can actually speak to you and let you know when there is a problem or service needed. A programmable thermostat automatically sets back the temperature in your home based upon a predetermined schedule. A non-programmable thermostat will stay at the same temperature 24 hours a day. This means that you never have to worry about fiddling with dials a dozen times a day and instead create your customized settings once and then you’re good to go. Programmable thermostats, like the ones available from Applewood, contribute to overall system performance, maximizing energy savings while providing complete comfort control. Offering set-it-and-forget-it programming, programmable thermostats make energy savings automatic.